First impressions are important. That’s why, when speaking with new independent and assisted living clients, these communities often communicate their desire to improve the appearance their lobby and entrance way as a priority among other areas. Not only are lobbies and entryways seen by the residents, but also prospective residents, family members, visitors, staff and other community members. Each of these groups will develop an impression and a sense of understanding of your community based on their first few moments and experiences in the lobby, so it’s important that impression is a positive one. We’re sharing three design considerations for lobbies of independent and assisted living communities. Does your community fit all three? 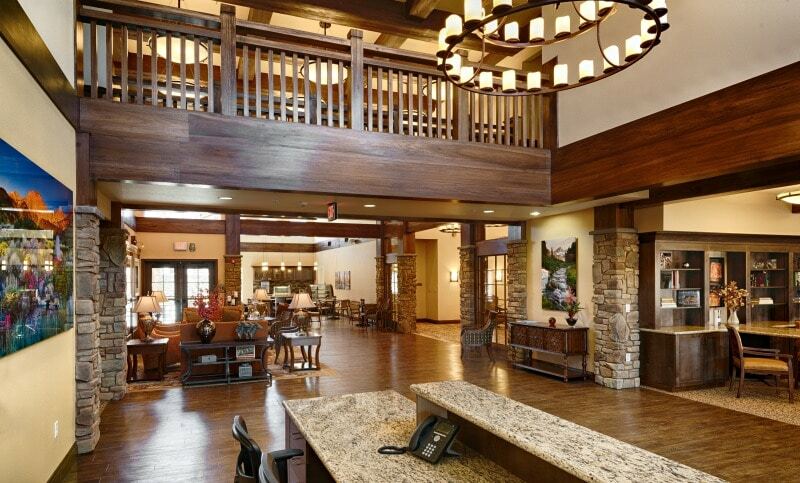 The lobby of senior living communities should convey your brand message assist in telling the story of “who you are”. A brand is what sets a company or organization apart from others, and that differentiation is a valuable asset to your business. Does your brand take pride in doing things “differently?” Is your brand luxury, or instead price-conscious? Is your brand active and health-focused? Each of those different brand identities can be conveyed via interior design. It need not be overtly obvious, but it should deliver a feeling and message that the individual understands without having to be explicitly told. An interior designer can utilize colors, fabrics, artwork and imagery, lighting, flooring, furniture and many other methods that fit your brand messaging and tell your story. Whether we admit it or not, research shows that many of us make emotionally-based decisions. Since the entryway and lobby are the first areas that community members, visitors, and prospective residents and their family members visit, it must leave a positive emotional impact. This may be a feeling of comfort, familiarity, support, community, or joy. Each of these (and other positive emotions) play a role in a prospective resident becoming a resident, or earning a good name in the local community. Conversely, a lobby can create feelings associated with terms like cold, clinical, outdated, unkempt, or disorganized, which result in negative emotions and associations with your community, and therefore negative business results. At Warner Design Associates, we take the emotional aspect of design into consideration throughout the lobby and community. In the senior living industry, first impressions can significantly impact your business. We help make sure that first impression is a positive one.